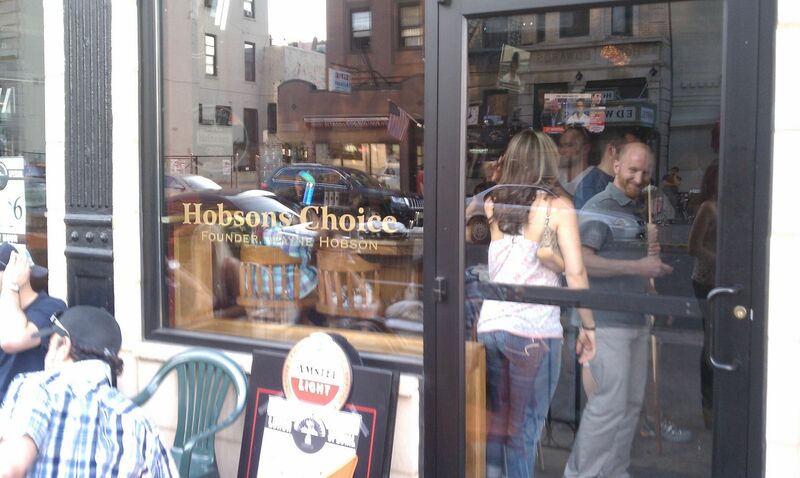 Hobson’s Choice- one of the more creative names of any bar in Hoboken. For those of you who don’t know, Hobson’s Choice is a saying that means “no-win decision.” Seems like a great name for a bar, and then when you consider the fact that it’s also named after its founder Wayne Hobson, one of the unfortunate victims of September 11th, you realize how great of a name it is. Located on the corner of Hudson Place and Hudson Street, Hobson’s Choice is one of the first bars you see when popping out of the Path Station and a few friends and I stepped into the bar on a beautiful Friday. Hobson’s Choice wasn’t even our first choice, but we really wanted a seat outside and most of the other places we walked by had all of their front patio seating full. But luckily we found a plastic table of four right smack on the corner of Hudson and Hudson which allowed us to enjoy the sun shining down at 3:30 pm on a Friday. I got a typical American light beer because it was on special, while the other members of our party ordered up a “Long Island Iced Tea” and a “Jack and Coke.” Sitting outside soaking in the sun, we were able to see everyone rushing out of the PATH and buses on their way home after an exhausting week. This could be one of the top people watching spots in all of Hoboken. After our first round I changed up my drink to a “Firefly and Lemonade,” hoping it would be like the Arnold Palmer that I had at Clinton Social. Unfortunately, it just tasted like watered down iced tea. My date then showed up and we ordered a round of shots and she ordered a vodka soda drink. The waitress (who was very attentive) quickly brought over both. However, the shot glasses were deceptively small and her mixed drink was a little light on the alcohol and even the last beer I ordered tasted like it was the last beer of an old keg- just something to consider if you go there an order a draught, shot, or mixed drink. The inside of Hobson’s Choice is your typical sports bar. Lots of TVs behind the bar and they even have TVs near the windows that you can reposition so that the people outside basically have their own personal TV to watch. Unfortunately the one near us wasn’t working. There is a pool table in the middle of the bar, and a good amount of hightops so that it makes for a great place for groups to congregate during happy hour. Also one thing to note so if you go there you won’t look as dumb as me, the bathroom is down the stairs to the right of the bar…it seemed tough to find at the time, but maybe it was also from being disorientated from drinking outside in the sun and then walking into a crowded, dark bar. Bar Type – Commuter/Happy Hour Bar. Crowd stereotype – Surprisingly a little older than I would have thought. Lots of people in their mid 30s. Music – Didn’t hear much because we were outside. Value – A couple of the beers I got were specials because of happy hour, but other than that the prices were pretty standard. The mixed drinks were a little light, and the shots were a little small so maybe they were not so great of a value. Hookup – Maybe later in the night if you have been drinking. First or last drink of the night – Great for a first drink of the night as you get off the PATH. 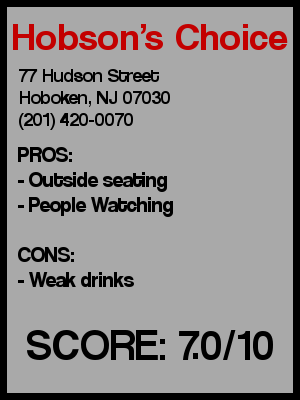 Overall - There is no doubt that this is one of the top 2 or 3 people watching bars in all of Hoboken. 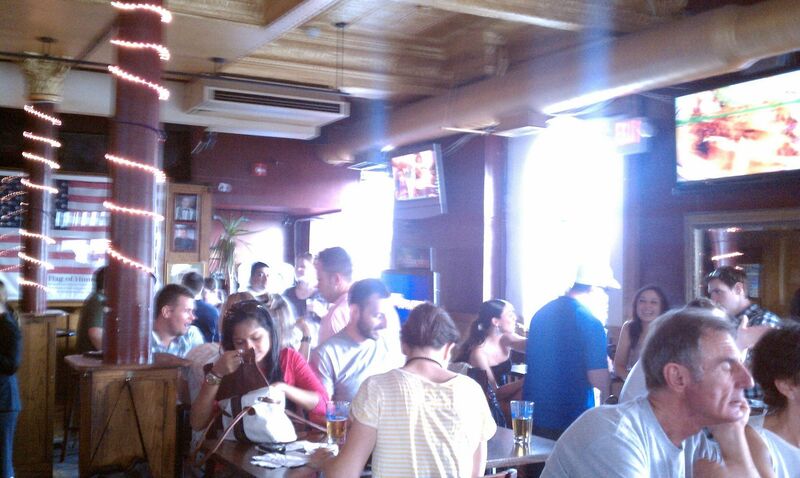 Bring your sunglasses, get a table outside, and watch the thousands of people flock into Hoboken. However, I was a little disappointed about how weak some of the drinks were. So because of that I wouldn’t make Hobson’s Choice my #1 choice…but it still has some good qualities. I’ll go with a 7.0.